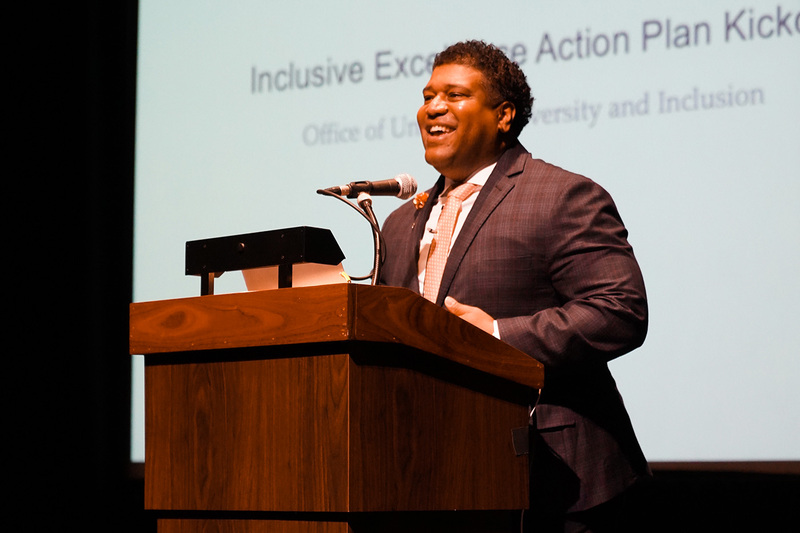 Thursday, Jan. 24, in Alex and Faye Spanos Theatre, the Office of University Diversity and Inclusion (OUDI) announced a $243,000 partnership with diversity expert Damon Williams to start the Cal Poly Inclusive Excellence Action Plan, which aims to create a more diverse environment within the university. Williams is a diversity, equity and inclusion expert who helped found the inclusive excellence model, which Cal Poly adopted in 2009. Williams has worked with more than 1,000 colleges and universities, leading to national recognition for his work in strategic diversity leadership and social impact. According to University Spokesperson Matt Lazier, Williams and his team will work with Cal Poly for at least a year, conducting a survey in April, compiling a report and giving recommendations on what to do with the survey’s results. Williams visited the campus in Fall 2018 to talk to students, faculty and staff about innovation, equity and inclusion. Lazier said Williams and his team will visit Cal Poly “as needed” and be in regular contact with the university. There is no set date for Williams to return. Lazier was not able to confirm who is funding Williams’ partnership, however he wrote in an email to Mustang News the partnership is not being paid for by tuition, student fees nor the general fund. “The big picture for this project is to develop an action plan that can really build from collective impact recommendations and help the university take some really important steps forward, aggressively, around creating a more inclusive and even more supportive environment for students, faculty and staff,” Williams said. The plan includes surveys to collect data that Williams said he hopes will help formulate strategies on how to create a more diverse community. A Campus Climate Survey was also performed in 2014. “It will also be used to help create a milestone to say, ‘Hey, this is where we are in terms of what our community says today,’ and then we can come back to that in a year or two years and say, ‘How have we improved?’” Williams said. This plan also emphasizes creating a leadership development that will help to understand how everyone plays a role in creating the everyday experience at Cal Poly, according to Williams. 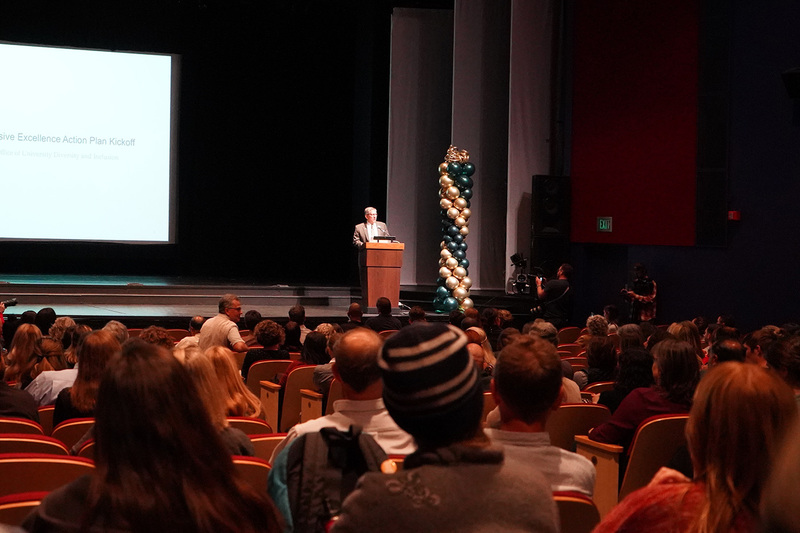 “We are calling them inclusive excellence leadership institutes, and inside these institutes we want to work with students, we want to work with faculty, staff and the whole community around how we all play a role in delivering the collective action and how we all play a role in creating an everyday culture and experience of inclusion at Cal Poly,” Williams said. Apart from surveys that will begin in April, Williams and the OUDI plan on creating different listening spaces to get conversations started. “[For] students, faculty and staff and different communities within, whether it’s gender, race ethnicity or nationality . . . we will create those conversation points and allow for those conversations to really inform our understanding of this experience,” Williams said. Although Williams said he believes the definition of diversity can be broad, he added each individual group has its own approach on engaging issues. “Each one of those identity groups is in their own historical, social, policy context so the thing I believe in is, let’s create a big tent and get everyone in the conversation,” Williams said. The year-long initiative is meant to develop a clear action plan, create a diverse infrastructure and strategy across the campus and prepare students through diversity and inclusion workshops and training developments. Students, faculty and staff will be able to take the survey beginning April 9. Editor’s note: This article has been updated with the correct price of the partnership with Damon Williams.